Even though most of us consider driving to be a mundane part of our daily lives, it is actually incredibly dangerous. Emergencies surrounding cars and driving are very common, and something that everyone should be prepared for. Keeping an emergency roadside kit in your vehicle is part of responsible driving. 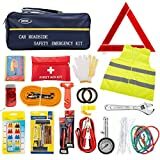 In the event of an accident, a breakdown, or a variety of other emergencies, you want to remain safe and visible to drivers, and the tools found in an emergency roadside kit can help you to do that. Emergency roadside kits come in all shapes and sizes. Below, we have outlined the three best overall emergency roadside kits. These kits are likely to contain a small version of everything you might need in a minor emergency. After that, we highlight a few specialty kits that you may want to consider purchasing to supplement your base kit. Imagine you are driving down a windy, unfamiliar road during a downpour. You drive carefully, but cannot prevent a hydroplane and wind up skidding off of the road. In that scenario, you definitely want to have this kit in your car. The DEDC Auto Emergency Kit is incredibly comprehensive, including a tire repair tool set, a tire pressure gauge, a pair of knit work cloves, three bungee cords, 15 nylon cables ties, two emergency glow sticks, an emergency raincoat, 2 PVC tape, a first aid kit, a set of battery clamp cords, a reflective safety vest, an LED flashlight, a three meter towing strap, a windshield/seatbelt cutting hammer, an adjustable wrench, a highly reflective warning triangle, a whistle, and a fuse set. All of that comes neatly packed into a 12” x 6” x 6” cloth case, which can easily be stored in your trunk. So the next time you find yourself off the road in a rainstorm, don the raincoat, set up the safety triangle, administer first aid as needed, and call for help. Now let’s pretend that you have been out skiing all day. Upon returning to your car, you discover that the battery is dead. You are in a remote location, and instant help is not available. This is the kit you want to have with you in that situation. 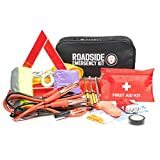 This kit includes a reflective warning triangle, a strong tow rope, two gloves with gripping palms, a safety hammer and seat belt cutter, an LED flashlight, adhesive tape, a raincoat, a tire pressure gauge, a screwdriver, jumper cables, and an emergency blanket. Once you are off the mountain, you can keep things visible with the LED flashlight, and stay warm under the emergency blanket until someone comes by to help jump your car with the included jumper cables. For this emergency situation, let’s pretend that your car has gotten stuck in some wet, heavy snow. You try to accelerate, but your tires just spin uselessly. This kit can help you get out of that jam. 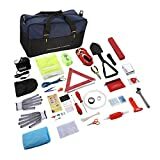 This emergency roadside kit includes plastic gloves, a double purpose screwdriver, reflective triangles, a tow rope, a rain poncho, a tire pressure gauge, booster cable, reflective clothes, a flashlight, electrical insulation tape, an emergency hammer, a first aid kit, and collapsible shovel. When you are stuck in the snow, you can set up the reflective triangles for safety, and then use the shovel to dig out the areas around your tires. So if you ride rough, definitely keep one of these in your trunk. 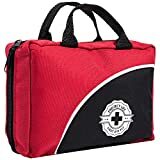 Miniature first aid kits are great for scrapes and bruises, but alcohol wipes and band-aids are probably not going to cut it during a serious vehicular accident. This first aid kit is much more robust than the ones you will find included in a baseline emergency roadside kit. The contents include antiseptic cleansing wipes (6 pieces), alcohol prep pads (10 pieces), butterfly closure strips (10 pieces), extra large adhesive bandages (4 pieces), adhesive bandages (25 pieces), knuckle adhesive bandages (4 pieces), fingertip adhesive bandages (8 pieces), gauze swabs (3 pieces), disposable cold compress (1 piece), first aid tape (1 roll), cotton tipped applicators (20 pieces), abdominal pad (1 piece), slim rescue howler whistle (1 piece), button compass liquid filled (1 piece), Moleskin blister relief (1 piece), triangular bandage (1 piece), emergency blanket (1 piece), glow stick (1 piece), disposable raincoat (1 piece), scissors and metal tweezers (1 piece), PBT conforming bandage (1 roll), CPR face mask (1 piece), eye pads (2 pieces), elbow/knee bandages (2 pieces), safety pins (4 pieces), sting relief pads (2 pieces), non-adherent pad (1 piece), and an adhesive wound dressing (1 piece). So stay safe and keep this in your car, just in case! If you are afraid of a remote crash that leaves you stranded on a back road somewhere, then this is a great thing to keep in your car. 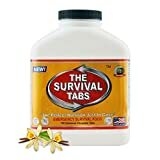 These meal replacement tablets contain 15 essential vitamins and minerals. One bottle can last up to 15 days for one person. So keep these with you, and know that if the worst comes to pass, you won’t have to worry about sustenance. When you are out on the road, stay alert, stay safe, and be prepared. The next time you jump in the car for a road trip, commute, or errand, make sure that one of the above kits is resting safely and securely in your trunk.